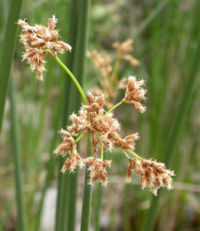 Four species of wild rice compose the genus Zizania (common names: Canada rice, Indian rice, and water oats), a group of grasses found in shallow water in small lakes and slow-flowing streams. Often only the flowering head of wild rice rises above the water. 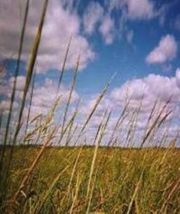 Northern wild rice (Zizania palustris) - an annual plant native to the Great Lakes region and aquatic areas of the Boreal Forest regions of Alberta, Saskatchewan and Manitoba. Wild rice (Z. aquatica) - also an annual, it grows in the Saint Lawrence River and on the Atlantic and Gulf coasts. Manchurian wild rice (Z. latifolia) - a perennial native to China. The seeds of the annual species Zizania palustris are those most commonly harvested as grain. Wild rice is high in protein, the amino acid lysine, and dietary fiber, and low in fat. Like true rice, it does not contain gluten. It is also a good source of the minerals potassium and phosphorus, and the vitamins thiamine, riboflavin and niacin. 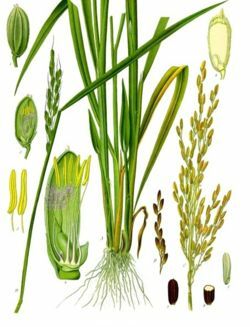 Domesticated rice comprises two species of food crops in the Poaceae ("true grass") family, Oryza sativa and Oryza glaberrima. These plants are native to tropical and subtropical southern Asia and southeastern Africa. Rice is a staple for a large part of the world's human population, especially in tropical Latin America and Asia, making it the second-most consumed cereal grain. A traditional food plant in Africa, rice improves nutrition, boosts food security, fosters rural development, and supports sustainable landcare. Rice provides more than one-fifth of the calories consumed worldwide by humans. 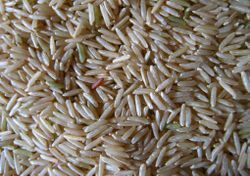 The seeds of the rice plant are first milled using a rice huller to remove the chaff (the outer husks of the grain), creating brown rice. The milling may be continued, removing the 'bran' (the rest of the husk and the germ), creating white rice. White rice, which keeps longer and is preferred by most, lacks some important nutrients; in a limited diet which does not supplement the rice, brown rice helps to prevent the deficiency disease beriberi. White rice may be also buffed with glucose or talc powder (often called polished rice), parboiled, or processed into flour. White rice may also be enriched by adding nutrients, especially those lost during the milling process. The cheapest method of enriching rice involves adding a powdered blend of nutrients that will easily wash off, but the United States requires a label warning against rinsing. More sophisticated methods apply nutrients directly to the grain, coating the grain with a water- insoluble substance resistant to washing. Rice is a good source of protein but it is not a complete protein: it does not contain all of the essential amino acids in sufficient amounts for good health, and should be combined with other sources of protein, such as nuts, seeds, beans, or meat. Watercresses Nasturtium officinale, N. microphyllum; formerly Rorippa nasturtium-aquaticum, R. microphylla) are fast-growing, aquatic/semi-aquatic perennial plants native from Europe to central Asia, and one of the oldest known leaf vegetables consumed by human beings. The plants are members of the Family Brassicaceae, or cabbage, family, botanically related to garden cress and mustard — all with a peppery, tangy flavour. The hollow stems of watercress are floating and the leaves are pinnately-compound. Watercresses produce small white and green flowers in clusters. 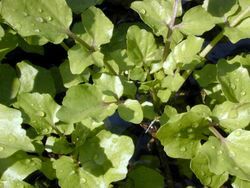 Cultivation of watercress is practical on both a large scale and a garden scale. Being semi-aquatic, watercress is well-suited to hydroponic cultivation, thriving best in water that is slightly alkaline. If unharvested, watercress can grow to a height of 50-120 cm. Also sold as sprouts, the edible shoots are harvested days after germination. Like many plants in this family, the foliage of watercress becomes bitter when the plants begin producing flowers. Watercress contains significant amounts of iron, calcium and folic acid, in addition to vitamins A and C. In some regions, watercress is regarded as a weed, in other regions as an aquatic vegetable or herb. Many benefits from eating watercress are claimed, including acting as a mild stimulant, being a source of phytochemicals and antioxidants, a diuretic, an expectorant, and a digestive aid. It also appears to have cancer-suppressing properties, and is widely believed to help defend against lung cancer. 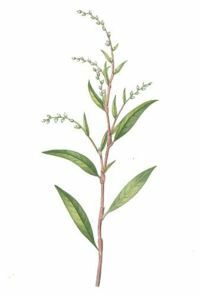 Water-pepper or Water pepper (Persicaria hydropiper, syn. Polygonum hydropiper) is a plant of the family Polygonaceae. It grows in damp places and shallow water; native to the temperate zones of the Northern hemisphere. It has some use as a spice because of its pungent flavour. In Japan the leaves are used as a vegetable - it should be noted these are from the cultivar, not the wild plant, which has a far more pungent taste. The seeds of the water-pepper are used in wasabi. Ipomoea aquatica is a semi-aquatic tropical plant grown as a leaf vegetable. Its precise natural distribution is unknown due to extensive cultivation, with the species found throughout the tropical and subtropical regions of the world. Common names include water spinach, swamp cabbage, water convolvulus, water morning-glory, kangkung, kangkong, eng chai, tangkong, kang kung, rau muống, kongxincai, home sum choy, and ong choy or tung choi. Ipomoea aquatica grows in water or on moist soil. Its stems are 2-3 m or more in length, hollow, allowing them to float and root at the nodes. The leaves vary from sagittate (typical) to lanceolate, 5-15 cm long and 2-8 cm broad. The flowers are trumpet-shaped, 3-5 cm diameter, usually white in color. It is most commonly grown in East and Southeast Asia. Because it flourishes naturally in waterways and does not require much care, it is used extensively in Malay and Chinese cuisine, especially in rural areas. It is often mistaken for watercress, which often grows in similar situations. It has also been introduced to the U.S., where its high growth rate caused it to become an environmental problem, especially in Florida and Texas. It has been officially designated by the USDA as a "noxious weed." The plant is not harmful when consumed, and is similar to spinach in its nutritional benefits. The vegetable is a common ingredient in Southeast Asian dishes, with the leaves often stir fried with chile pepper, garlic, ginger, dried shrimp paste, and other spices. Wasabi is a member of the Brassicaceae family, which includes cabbage, horseradish and mustard. Known as "Japanese horseradish," its root is used as a spice and has an extremely strong flavor. Its hotness is more like that of a hot mustard than the capsaicin in a chili pepper, producing vapors that irritate the nasal passages more than the tongue. The plant grows naturally along stream beds in mountain river valleys in Japan. There are also other species used, such as W. koreana, and W. tetsuigi. The two main cultivars in the marketplace are W. japonica cv. 'Daruma' and cv. 'Mazuma'. Wasabi is generally sold either as a root (real wasabi), which must be very finely grated before use, or as a ready-to-use paste. Fresh leaves of wasabi can also be eaten and have some of the hot flavor of wasabi roots. They can be eaten as wasabi salad by pickling overnight with a salt-and-vinegar-based dressing, or by quickly boiling them with soy sauce. The leaves can also be battered and deep-fried into chips. Wasabi is often served with sushi or sashimi, usually accompanied with soy sauce. Recent studies have shown that wasabi contains a natural chemical that can be used against certain cancer cells. This unique root can also be used for oral hygiene and infections. It has been suggested that Wasabi can help prevent cardiovascular diseases like stroke, heart attack, and hypertension. The health benefits are many. The root can help with diarrhea, osteoporosis, asthma, arthritis, and allergies as well. The Chinese water chestnut (Eleocharis dulcis; synonyms E. equisetina, E. indica, E. plantaginea, E. plantaginoides, E. tuberosa, E. tumida), more often simply called the water chestnut, is a grass-like sedge grown for its edible corms. It has tube-shaped, leafless green stems that grow to about 1.5 metres. The water caltrop, which is also sometimes referred to by the same name, is unrelated and often confused with the water chestnut. The Chinese water chestnut is native to China and is widely cultivated in flooded paddy fields in southern China and parts of the Philippines. The small, rounded corms have a crisp white flesh and can be eaten raw, slightly boiled, grilled, pickled, or tinned. They are a popular ingredient in Chinese dishes. 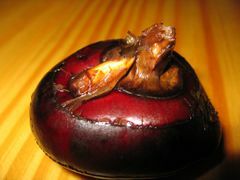 In China, they are most often eaten raw, sometimes sweetened. They can also be ground into a flour used to make water chestnut cake, which is common as part of dim sum cuisine. They are unusual among vegetables for remaining crisp even after being cooked or canned. They do this because their cell walls are cross-linked and strengthened by certain phenolic compounds, a property shared by other vegetables that remain crisp in this manner, including the tiger nut and lotus root. The corms are rich in carbohydrates (about 90 percent by dry weight), especially starch (about 60 percent by dry weight), and are also a good source of dietary fiber, riboflavin, vitamin B6, potassium, copper, and manganese. 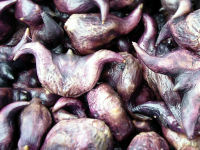 The water caltrop or water chestnut is either of two species of the genus Trapa--Trapa natans and Trapa bicornis. Both species are floating annual aquatic plants, growing in slow-moving water up to 5 meters deep, native to warm temperate parts of Eurasia and Africa. They bear ornately-shaped fruits that resemble the head of a bull, each containing a single large, starchy seed. It has been cultivated in China for at least 3,000 years for the seeds, which are boiled and sold as an occasional streetside snack. It was possible to buy water chestnuts in markets all over Europe until 1880. In northern Italy, the nuts were offered roasted, much as sweet chestnuts (Castanea sativa Mill.) are still sold today. At many places in Europe water chestnuts were known and used for human food until the beginning of the 20th century. Today, however, it is a rare plant. Taro (from Tahitian or other Polynesian languages), more rarely kalo (from Hawaiian), is a tropical plant grown primarily as a vegetable food for its edible corm, and also as a leaf vegetable. It is considered a staple in oceanic cultures. It is believed to be one of the earliest cultivated plants. Taro is closely related to Xanthosoma and Caladium, plants commonly grown as ornamentals and, like them, it is sometimes loosely called elephant ear. In its raw form, the plant is toxic due to the presence of calcium oxalate, although the toxin is destroyed by cooking or can be removed by steeping taro roots in cold water overnight. The small round variety is peeled and boiled, sold either frozen, bagged in its own liquids, or canned. The plant is actually inedible when raw because of needle-shaped raphides in the plant cells. 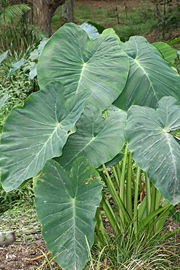 Typical of leaf vegetables, taro leaves are rich in vitamins and minerals. They are a good source of thiamin, riboflavin, iron, phosphorus, and zinc, and a very good source of vitamin B6, vitamin C, niacin, potassium, copper, and manganese. Taro corms are very high in starch, and are a good source of dietary fiber. Oxalic acid may be present in the corm and especially in the leaf, and taro should be eaten with milk or other foods rich in calcium to remove the risks posed by ingesting the oxalate ion, especially for people with kidney disorders, gout, or rheumatoid arthritis. Calcium reacts with the oxalate to form calcium oxalate, which is very insoluble. 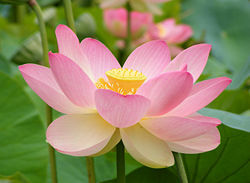 Nelumbo nucifera is known by a number of common names, including blue lotus, Indian lotus, sacred lotus, bean of India, and sacred water-lily. Botanically, Nelumbo nucifera (Gaertn.) can also be referred to by its former names, Nelumbium speciosum (Wild.) or Nymphaea nelumbo. Lotus is an aquatic perennial but, if its seeds are preserved under favorable conditions, they can remain viable for many years. The flowers, seeds, young leaves, and "roots" (rhizomes) are all edible. In Asia, the petals are sometimes used for garnish, while the large leaves are used as a wrap for food. The rhizome is used as a vegetable in soups and stir-fried dishes. Petals, leaves, and rhizome can also all be eaten raw, but there is a risk of parasite transmission (e.g. Fasciolopsis buski): so it is recommended they be cooked before eating. Chinese have long known that Lotus roots are a very healthy food and have been using them in this way for centuries. Recent studies have shown Lotus roots to be rich in dietary fiber, vitamin C, potassium, thiamin, riboflavin, vitamin B6, phosphorus, copper, and manganese, while very low in saturated fat. The stamens can be dried and made into a fragrant herbal tea, or used to impart a scent to tea leaves. The lotus seeds or nuts are quite versatile, and can be eaten raw or dried and popped like popcorn. They can also be boiled until soft and made into a paste, or boiled with dried longans and rock sugar to made a tong sui (sweet soup). Combined with sugar, lotus seed paste becomes one of the most common ingredients used in pastries such as mooncakes, daifuku, and rice flour pudding. Typha is a genus of about eleven species of monocotyledonous flowering plants in the monogeneric family, Typhaceae. The genus has a largely Northern Hemisphere distribution, but is also found in a variety of wetland habitats. 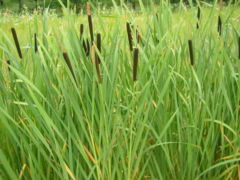 These plants are known in British English as bulrush, bullrush or reedmace and in American English as cattail or punks. Cattails should not be confused with the bulrush of the genus Scirpus. The most widespread species is Typha latifolia, extending across the entire temperate Northern Hemisphere. T. laxmannii, T. minima and T. shuttleworthii are largely restricted to Asia and parts of southern Europe. 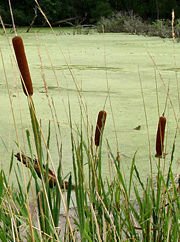 Cattail has a number of parts edible to humans. The rhizomes are a pleasant, nutritious and energy-rich food source, generally harvested from late Fall to early Spring. They are starchy, but fibrous, so the starch must be scraped or sucked from the tough fibers. In addition to the rhizomes, cattails have little-known, underground, lateral stems that are quite tasty. In late spring, the bases of the leaves, while they are young and tender, can be eaten raw or cooked. As the flower spike is developing in early summer, it can be broken off and eaten and, in mid-summer, once the flowers are mature, the pollen can be collected and used as a flour supplement or thickener. Schoeneoplectus californicus is a species of sedge known by the common names California bulrush and giant bulrush. 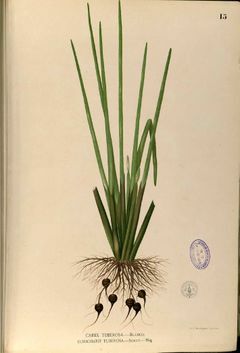 It is also sometimes called "tule", but the closely related Schoenoplectus acutus is the more correct owner of that name. It has a rhizome and is found in marshy areas from southern and western North America to South America and on Pacific islands including some of those in the Hawaiian and Cook chains. It has tall, thin, dark-green stems which are usually triangular in cross-section, with woolly, bristly tan or brown flowers. A notable subspecies is the Totora, Schoenoplectus californicus ssp. tatora. It is famous for making up the floating islands on which the Uros people of Lake Titicaca dwell, as well as occurring on isolated Easter Island in the Pacific. Common in ponds and marshes, (correctly the false bulrush or common reedmace, Typha latifolia) the young sprouts and shoots can be eaten in salads, the pollen is used as a flavoring, and the roots and unripe flower heads can be boiled as a vegetable. and other chemicals you may use, the types of wildlife that visit your water garden, etc. If in doubt, COOK the plant to kill bacteria and parasites that may be present. Do not eat it raw without taking proper precautions.